A tribute to the Pacific Railroad and the conquest of the American West. Williams' New Trans-Continental Map of The Pacific R.R. and Routes of Overland Travel to Colorado, Nebraska, The Black Hills, Utah, Idaho, Nevada, Montana, California and the Pacific Coast. A scarce and exceptionally attractive first edition example of Henry Williams' 1876 map of the Pacific Railroad. Centered on the line of the Pacific Railroad as it travels westward across the continent to California, this map covers from Omaha, to San Francisco and from Olympia, Washington to San Diego, California. 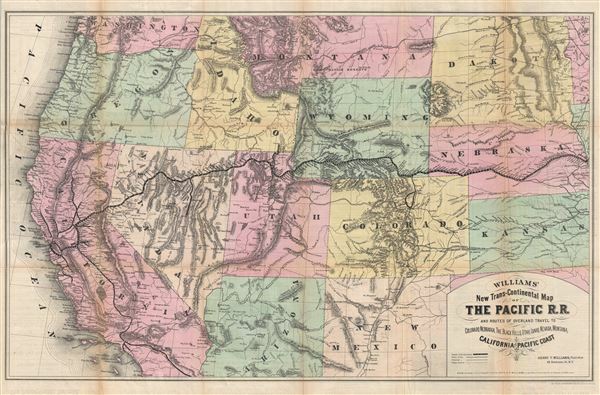 States, topography, towns and cities, American Indian tribes, are boldly defined in vibrant color and fine engraving. In no part of the world is travel made so easy and comfortable as on the Pacific Railroad. To travelers from the East it is a constant delight, and to ladies and families it is accompanied with absolutely no fatigue or discomfort. One lies at home in the Palace car with as much true enjoyment as in the home drawing room … On the second day out [of Omaha], the traveler is fast ascending the high plains and summits of the Rocky Mountains … He is alive with enjoyment, and yet can scarcely tell why … Ah It is this keen, beautiful, refreshing, oxygenated, invigorating, toning, beautiful enlivening mountain air which is giving him the glow of nature, and quickening him to greater appreciation of this grand impressive country. In addition to the main line of the Pacific Railroad, Williams also identifies secondary tributary lines, such as the narrow gauge railway from Palisade to the mining town of Eureka, Nevada. Other tributary lines of note include the Denver Pacific line extending into Colorado, the Franklin Idaho Line, and various extensions through California, most focusing on the San Francisco - Sacramento region. The railroad was essential to the development of the American mining industry in the west, providing much needed supplies to mining enclaves in Colorado, Nevada, and California. Although his primary focus is on the Pacific Railroad, other lines of note including those still under construction such as the Southern Pacific and Northern Pacific, as well as various smaller rail networks inching their way through Colorado, New Mexico, and Kansas. This map was prepared and published by Henry Williams for the 1876 first edition of his Pacific Tourist. The map was printed by the A. M. Photolithographic Company of New York using the Osborne Process. Williams himself maintained offices at 46 Beekman Street. There are several subsequent editions, but all are scarce, none more than this the first. Williams, H., Pacific Tourist, (New York) 1876. Very good. Some fold toning and splits repaired on verso. Backed with archival tissue. Rumsey 3929.000 (1877). Francaviglia, R., Mapping and Imagination in the Great Basin: A Cartographic History, pages 136-38. Akerman, J., Cartographies of Travel and Navigation, p. 162-63.